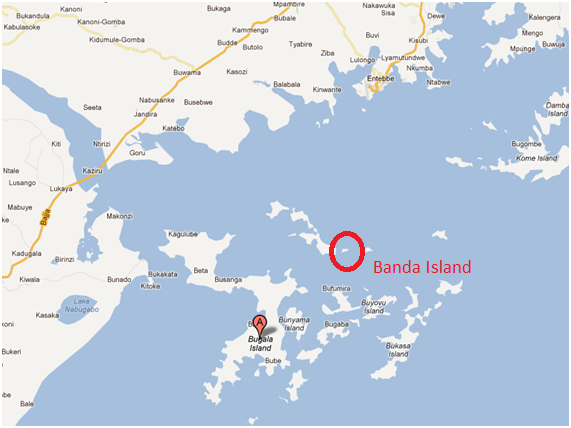 Banda Island is the pearl of the eighty-four islands of the Ssese Island Archipelago in the Northwest of Lake Victoria, Uganda. The resort occupies ten hectare of Banda Island (of a total of 80 hectare). On the other side of the island is a small fishing village. Satellite image of the resort, with the front beach and bar top right, the castle on the point and the grassy back beach down. So I’m planning to have a few days or a weekend away to this island, with about 15-20 people in december 2015 and i would like to know how much that will cost me because the website does not have rates. I would appreciate a reply. I hope to hear from you soon. Great you are planning a real party! It will be 110,000 per person per night for the lazy camping and dormitory and 130,000 for the cabins and furnished safari tents. Because you are a big Group we can organize a barbecue for you. The above rates include All meals And tea and coffee complimentary. I think we were one of his first guests (1999) in a bungalow that was not completed and the insects were awful (after dark). He invited us to come over for a night after meeting him in Kampala. He was very hospitable and provided us with an amazing meal and was proud to show what he was trying to do with the island. I can send you some pics if you would like though I would have to scan them to get them to you. Sorry, no digital prints in 1999. Best regards. Will and Tamra Morrison, Olympia, WA, United States. What a nice unexpected message! I am so happy! Thanks for that and YES PLEASE send me those pics. My oldest pictures (just digitals were coming up) are from 2002 when I was a guest on Banda. Then Dom and I became best friends. I’d love to make a page with Banda Memories. Banda still has the Dominic feel, it has just been a bit feminized. And our food is still amazing. Maybe you remember a small boy there: Kito? He is our co-manager and chef – which he learnt from the master. Cool you have found our website. Do you like it? Are you planning to come to Uganda any time in the future? sorry to hear about Dom. and we greet you now from Namibia. searching for the source of the nile. Hello Hello!!!!! That is a nice surprise. It must be about ten years ago. A nice party indeed. Am surprised you guys are now in Namibia but not surprised at all you’re still together. Terrible Dom died, but we keep Banda alive in his memory. If there is any after life he must love we still cook his recipes but send thunder and lightning on me for the light blue curtains.